The preferred personal transport of the Antarctic. Ski Doos are a very good way of getting around and also extremely fun to ride. 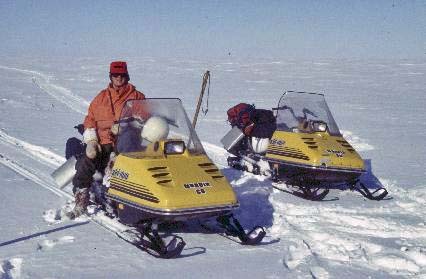 We had three types of Ski Doo at Halley, though I only have pictures of 2. The missing machine was called an Elan and could just about fit one person on. It was about half the size of the others only only really fit for short distance travel around base (it was also much slower), but I liked it. This is me sitting on a Nordic ski doo. These ones only went off base on known routes. In this case we went down to the coast to carry out a sea ice observation for the ship. The Nordic was the faster of the two big ski doos. It has two front ski which aid stability and a single track for propulsion. 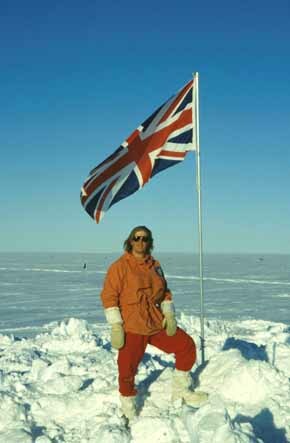 I do not know exactly how fast they could go, mainly because I tended to fall off at high speed because the ground was hard & bumpy most of the time at Halley. You could get a good turn of speed going and then, out of the blue, go over a lump & get thrown off. Quite thrilling stuff really. The mechanic didn't like us going fast on them as he was the man that had to put them back together again after we'd bent them. 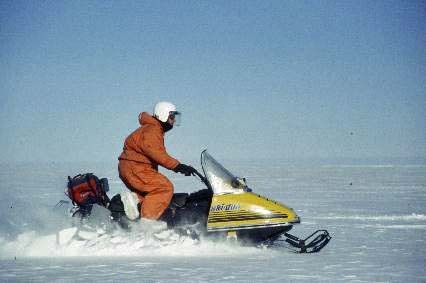 This is not me, but shows a skidoo in full flight. The snow was particularly soft on this day, so it sank down a fair bit. The snow was usually either too hard or too soft. Very occasionally we would get a perfect ski doo surface & average speeds would go up all around the base. These are Bombarider ski doos. We used these to go off the beaten track on field trips. These two are of the older design (newer one below). They have a single front ski, but a double track at the back. This helps to spread the weight of the ski doo for when travelling over crevasses & also give mroe traction for pulling a heavy field sledge. 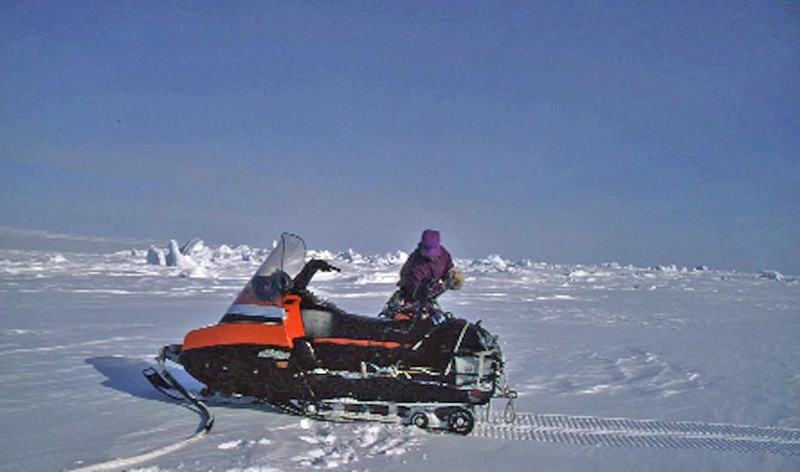 When off base on unknown terrain, we would pair up & link the ski doos & sledges together. We would have a lead ski doo pulling a sledge with that sledge linked to the front of the second ski doo which also pulled a sledge. The idea is that if any of the 4 components fell down a crevasse the other three components of the chain would be able to brace it. 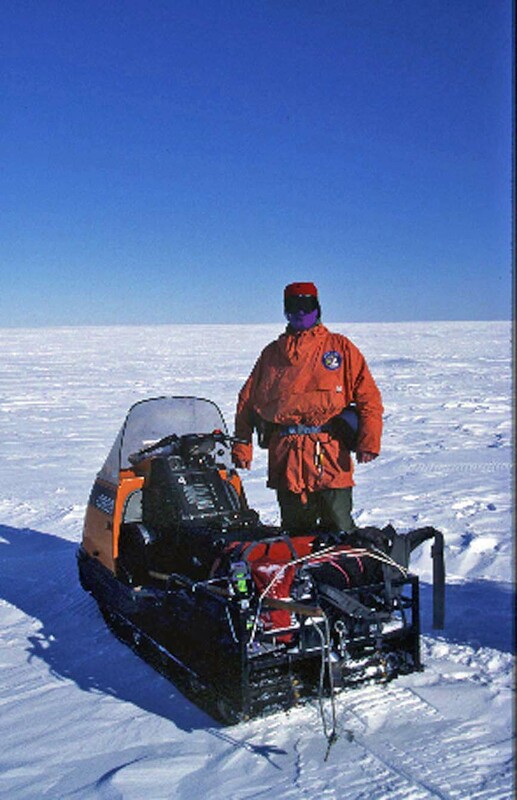 Luckily I never encountered a lost ski doo or sledge on my travels - extraction of such things form a crevasse would be a very tedious process. The worst we had was sledges that were top heavy & liked to roll over onto their sides when going over bumps at the wrong angle. Ski doos a petrol powered & are started by a yank on a cord. Sometimes they would decide that they were quite happy where they were & refuse to start, usually when most inconvenient. This shows a colleague starting one of the new, updated, Bombardier ski doos. As soon as we stopped for a rest, the helmets came off - they were uncomfortable & cold. rest stops were frequent as riding a ski doo in the cold is very unpleasant. Every thing goes numb & you sometimes you have to hang on for dear life as the ski doo rocks & rolls over the terrain. At this stop, the GA was getting a GPS fix. This was the first time a GPS had been used on a field trip, but there was only one GPS on the base! Had we run into trouble we would know exactly where we were in the wilderness but that wouldn't have helped the rescuers who would be restricted to following tracks and instincts since there are no maps & no roads. Out in the field we always wore crash helmets, in case the ski doo went down a crevasse. This photo shoes the tread marks of the double track quite nicely. Lots of grip was essential when pulling the heavy field sledges. Generally speaking, the helmet came off as soon as the skidoo stopped since it was warmer to wear a hat. This is me with an old Bombardier ski doo. You can see that I have a face mask on to protect form the cold. When travelling on a ski doo in the cold, the wind chill can be quite fearsome, especially when you are heading into the wind.